HOURS VARY FROM WEEK TO WEEK; I’m also open by appointment. Please call if you want to visit outside my usual hours. Since 1997—it’s my 22nd year! My usual hours are 1–7 pm, six days a week (with the closed day varying from week to week). Please call ahead to check for weekly variations the schedule; my hour are here on my website, on my voicemail, and posted in front of the shop. I’d also be happy to make an appointment at a time convenient for you. Worldwide shipping, gift certificates, registries, and free gift wrapping always available! Mastercard, VISA, AMEX, Discover (both credit and debit), personal checks, and traveler’s checks accepted. Oh yes, cash, too. PLEASE NOTE: As of March 3, 2016, I will no longer accept AMAZON VISA cards. I have no interest in encouraging people to buy more on Amazon. I hear this question every single day. Yes, of course I do! That’s where I get 99% of my stock. I don’t usually buy entire collections; I carefully choose books that suit my shop. The easiest way to show me what you have is by taking digital photos of the books on shelves or in stacks, so that the spine titles can be read, and emailing those to me. If you have fewer than a dozen books, call and read me the titles. Donations are also welcome! 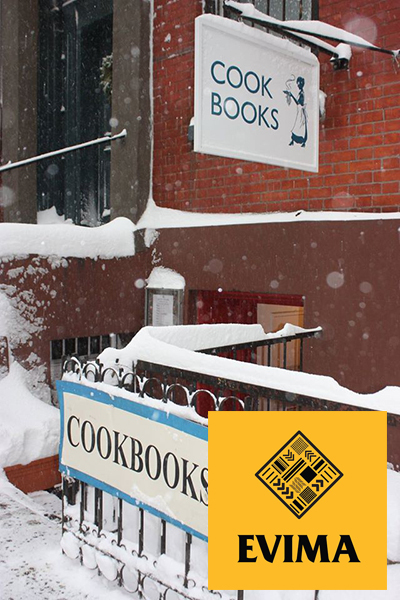 It has been my great pleasure to serve up a delicious selection of cookbooks to customers near and far for the past 20 years. I opened the first incarnation of my bookshop in a basement office on Washington Place and Barrow Street in October of 1997. What was I, crazy? I was trying to set up and run a business while simultaneously working at a day job (at a small publishing company). I sent out hand-written announcements and some sort of press release. Florence Fabricant wrote about me in the Times, and the article appeared the day before Thanksgiving–a day when even the most disinterested are likely to glance at the Dining section. As often happens, Ms. Fabricant’s piece was the shot heard ’round the world, the phone started ringing, and soon it was time to leave the day job (I was conveniently laid off) and devote myself full-time to the shop. Look at all the changes in the book business since then. Where are the Barnes & Noble stores that once graced every third corner in midtown? For that matter, where is the B&N flagship store—the textbook store, where frugal students bought their books secondhand? And B. Dalton, Waldenbooks, Tower Books, Border’s? Gone, baby, gone. But it’s not as if there are no bookstores left in the city, and we certainly have our share downtown. There’s Three Lives & Company, in the Village for more than thirty years now; McNally Jackson, a relative newcomer that’s become a neighborhood hub; BookBook, rudely displaced by a Marc Jacobs “bookstore” a few years ago, now thriving farther east on Bleecker; and (everyone’s favorite bookstore name of all time), Unoppressive Non-Imperialist Bargain Books on Carmine Street. I hardly need to mention the Strand, for both new and used books—don’t ever forget that it, too, is an independent, family-owned business. We’re lucky also to have plenty of shops filled with used, out-of-print, and antiquarian books (and records, CDs, prints, photos, posters, maps). If you come into mine, I’ll hand you a list and map of both kinds of stores (the list is also on the Neighborhood page of this website). I love the responses this brings: “Really? There are still that many?” “Wow, I thought all the bookstores had closed!” No, they haven’t. And with your help—that is, your patronage—they won’t. By the way, the same is true of the neighborhood (non-chain) drugstore, hardware store, and coffeeshop. The prices may be a little higher (remember, this is an individual—not a multinational corporation—dealing with insane overhead, taxes, and fees). But in the long run, it’s well worth the cost.